All Park Place Condominiums homes currently listed for sale in Surprise as of 04/20/2019 are shown below. You can change the search criteria at any time by pressing the 'Change Search' button below. 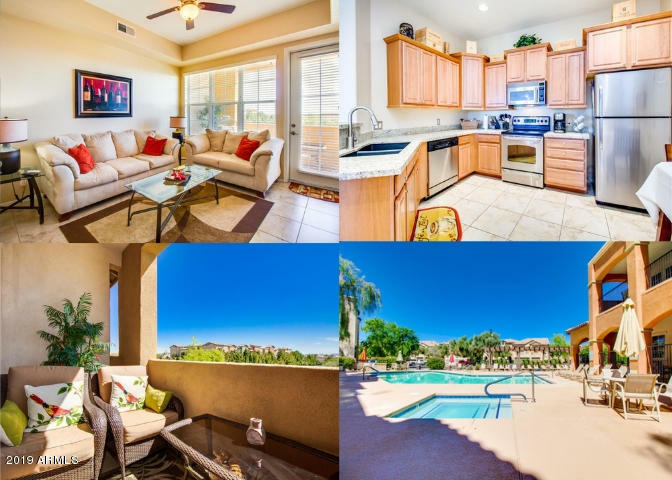 "Spacious, well-maintained 2 bedroom, 2 bath plus den 3rd floor Acacia unit featuring beautiful views from the patio! Exhibits excellent pride of ownership. Perfect for winter visitors or someone looking for a low maintenance lifestyle & home. Tiled throughout kitchen & living area, neutrally carpeted bedrooms, new granite installed in kitchen & both bathrooms with new under mount sinks, SS kitchen appliances, kitchen features large walk-in pantry. This unit is located in highly desired main buil"